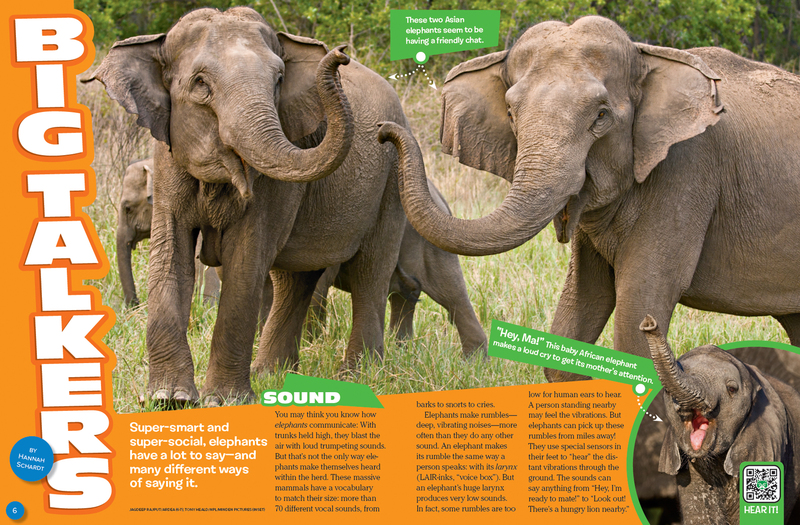 Super-smart and super-social, elephants have a lot to say—and many different ways of saying it. 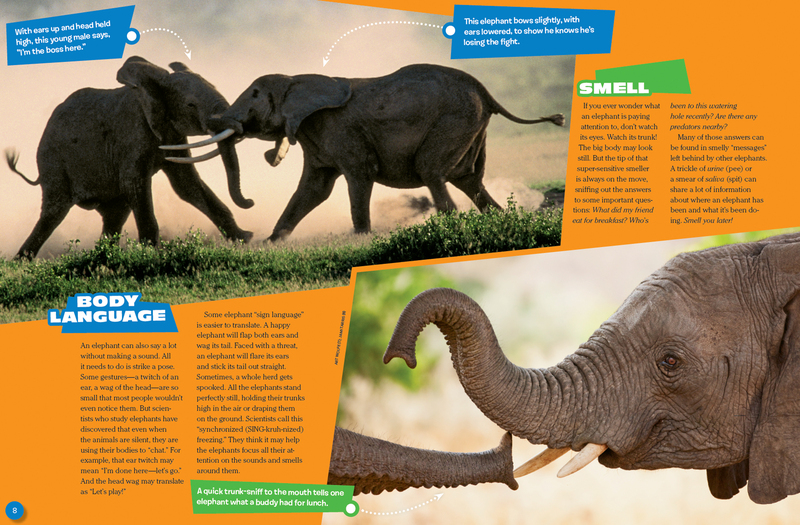 You may think you know how elephants communicate: With trunks held high, they blast the air with loud trumpeting sounds. But that’s not the only way elephants make themselves heard within the herd. These massive mammals have a vocabulary to match their size: more than 70 different vocal sounds, from barks to snorts to cries. Some elephant “sign language” is easier to translate. A happy elephant will flap both ears and wag its tail. Faced with a threat, an elephant will flare its ears and stick its tail out straight. Sometimes, a whole herd gets spooked. All the elephants stand perfectly still, holding their trunks high in the air or draping them on the ground. Scientists call this “synchronized (SING-kruh-nized) freezing.” They think it may help the elephants focus all their attention on the sounds and smells around them. If you ever wonder what an elephant is paying attention to, don’t watch its eyes. Watch its trunk! The big body may look still. But the tip of that super-sensitive smeller is always on the move, sniffing out the answers to some important questions: What did my friend eat for breakfast? Who’s been to this watering hole recently? Are there any predators nearby? Many of those answers can be found in smelly “messages” left behind by other elephants. A trickle of urine (pee) or a smear of saliva (spit) can share a lot of information about where an elephant has been and what it’s been doing. Smell you later! When human toddlers feel tired or sad, they may head for the comfort of a parent’s lap. Elephant calves do something similar. Worn out from playing or stressed by an unfamiliar situation, a calf will tuck itself under Mom’s big, sheltering body. (Elephants don’t have laps!) That lets Mom know that her baby needs extra attention. Moms and ­babies aren’t the only elephants that get “touchy-feely.” Throughout a herd, touching helps create bonds of family and friendship. One female may pat another with her trunk: “How’s it going?” A male may twist his trunk around a female’s: “I like you!” Or one elephant may use its trunk to shove another: “Back off! You’re getting on my nerves.” Who needs words when you have a trunk? Just as in human families, though, not all elephants get along all the time. One member of the zoo’s herd, Swarna, recently got into a tiff with Ambika, the 68-year-old “grandmother” of the herd. On this morning, it’s clear to Debbie that Ambika hasn’t forgiven Swarna yet. “You can tell she’s keeping an eye on her,” says Debbie. 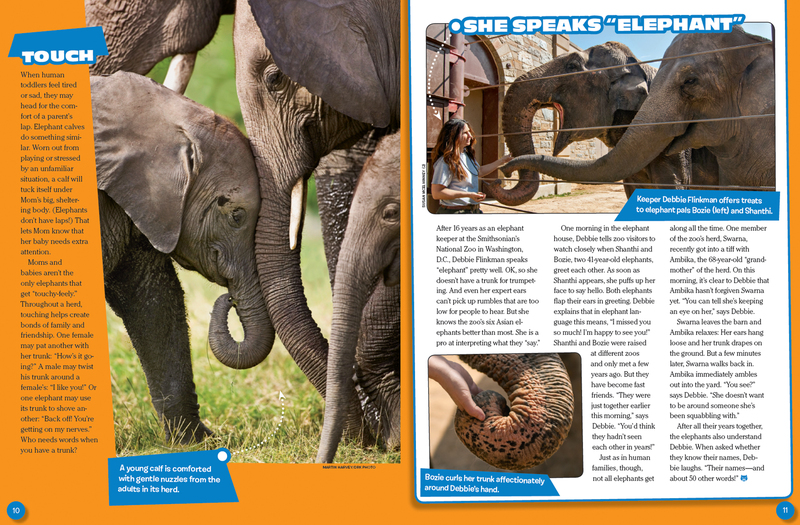 “Big Talkers” originally appeared in the September 2016 issue of Ranger Rick magazine.